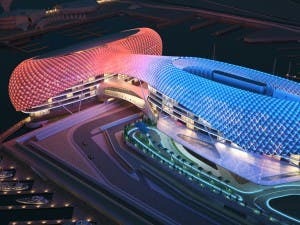 IN a previous life (before the Little Geranium) I was CEO of a hospitality company that looked after some of the most famous Formula 1 circuits, including Silverstone, Monaco and Yas Marina in Abu Dhabi. I got to meet many of the drivers, among them Jenson Button whom I came to know well. He booked his wedding at my hotel near Cambridge in the ’90s but split from his fiancé and cancelled it! He is a very likeable guy, one of the really genuine ones. I cooked for many of Abu Dhabi’s potentates, among them HH Sheik Hamed Bin Zayed, one of the rulers. I prepared him a very simple BBQ one lunch time with steaks that we had specially imported from Argentina (just like those on my menu at The Little Geranium.) I also made a sashimi of smoked salmon which I smoked myself (you’ll find this dish on the Geranium’s menu, too). Classically, in Argentina, they serve their meat with chimichurri sauce. I had never made it before and the Yas Marina internet had gone down so I couldn’t check the ingredients. I knew the meat was going to be great and I had blackened it a little on the barbecue, keeping it pink and rare in the middle, as it really tastes good like that. “Yes your highness, of course, it would be my pleasure,” I replied. “And bring some of that chimichurri with you please,” he added. When I got back to the hotel I checked the ingredients for chimichurri online. It was nothing like what I served him! I have to agree, though, it did taste great and makes a pleasant change with beef. Anyway, here it is, my original chimichurri sauce, made personally for His Highness of Abu Dhabi. Try it with the best bit of beef you can get. Naturally, it’s also on the menu at The Little Geranium! Blend the herbs, onions and the garlic to a rough paste in a food processor. Now add the chilli sauce and the chilli flakes and the olive oil and vinegar and the honey. If a little thick, add a touch of water taste and season with salt. The sauce should be green and thickish with speckles of red chilli. In Argentina they use a red pepper that is slightly spicy but is difficult to get that over here. They also use fresh oregano but I have never seen that over here, only dried oregano. Spoon it into a small dish and allow your guests to spread a little over the beef as they wish. It is great with barbequed meats.